19450 Lance Corporal Thomas John Williamson M.M. Thomas John Williamson was the son of James and Hannah Williamson. Thomas was born Donaghmore, Co. Tyrone about 1896. The family lived in Lisfearty, Clananeese, Tyrone. James Williamson was an agricultural labourer. Thomas Williamson enlisted in Ballygawley. Lance Corporal Thomas John Williamson was serving with the 9th Battalion of the Royal Inniskilling Fusiliers when he died on 21st May 1918 in France. He was 22 years old. Lance Corporal Thomas John Williamson was awarded the Military Medal. Canada Farm Cemetery is located 8.5 kilometres north-west of Ieper town centre, on the Elzendammestraat, a road leading from the Veurnseweg (N8) connecting Ieper to Elverdinge and on to Veurne. From Ieper town centre the Veurnseweg (N8) is reached via Elverdingsestraat, then turning right onto Haiglaan. Veurnseweg is a continuation of Haiglaan. On reaching the village of Elverdinge the Steentjesmolenstraat, N333, leads towards Poperinge. 2 kilometres along the Steentjesmolenstraat lies the right hand turning onto Elzendammestraat. The cemetery itself is located 1 kilometre along the Elzendammestraat on the right hand side of the road. 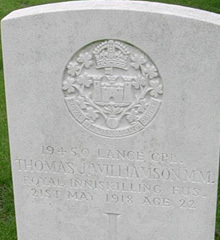 6 War Graves Photographic Project Photo of Thomas John Williamson's headstone can be purchased here.